Join our mailing list (see the block on the right) to be the first to find out about WebRTC news and events. You can also get webRTC tips and tutorials sent right to your inbox. WebRTC Ventures — a provider of custom, real-time applications with video, voice, and data exchange — has been selected to present their new product, UniWellness, a telemental health application, in the Startup Alley -The Virginia Venture Summit at DownRiver April 24, 2019 at Bon Secours Redskins Training Center in Richmond. Activation Capital and Venture Forum RVA hosts the DownRiver event in order to bring together people from across Virginia’s entrepreneurial ecosystems for a day of networking, learning, and collaboration. Some of the Commonwealth’s most promising early-stage companies are chosen to present on Startup Alley. WebRTC Ventures — a provider of custom, real-time applications with video, voice, and data exchange — today announces that they will present their new product, UniWellness, a telemental health application, at the American Telemedicine Conference April 14-16, 2019 in New Orleans. WebRTC Ventures — a provider of custom, real-time applications with video, voice, and data exchange — today announces the hiring of Ginger Germani as its Director of Telehealth Accounts. Germani joins the WebRTC.ventures’ team with a degree in Economics from Randolph-Macon College in Virginia and over twenty years of experience in relationship based, custom business solutions from marketing to commercial lending. She seeks to leave everyone she meets, either personally or professionally, better informed and on a successful path. With two sons suffering from varying degrees of mental illness, Germani has spent years navigating mental health care. In 2017, Germani’s oldest son, age 19, lost his battle with depression and anxiety to suicide. After his tragic death, she understood that her purpose in life is to use her skill set to change the landscape and accessibility of quality mental healthcare. Introducing a Licensed Expert Consultation Platform under your Label & Brand! Are you looking for a custom real time video and audio licensed expert consultation platform to further support and engage customers? Are you looking for an already-built platform that can be easily customized and quickly released to market? If so, you are in luck! 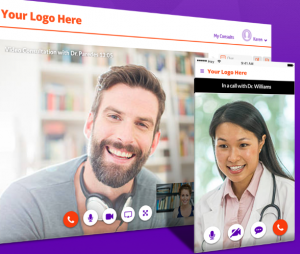 WebRTC Ventures recently announced a new product offering: an expert consultation platform which you can license under your logo and brand. Do you have customers that you meet with in person? Well, in this day-and-age, customers are looking for convenient ways to connect face-to-face no matter the place. Now is the time to give them want they not only want, but expect. Maybe you are looking for an application in which you can host online appointments? Are you in the one of the following fields? When Train-With’s founder, Rachel Aram decided to create a platform which provides one the ability to take a group fitness class or train with a favorite trainer regardless of time and location, she turned to the WebRTC.ventures team to get professional help in developing and launching her mobile live video fitness training application. Here’s an example of how Train-With can be used — you are traveling, or you move to another state but still want to work out with your former fitness class or trainer, you can still do that remotely right from your tablet or phone. “I had a lot of options of developers in the San Francisco Bay Area but wanted a cohesive team of experts in live streaming technology; so I chose webRTC.ventures”, said Aram. WebRTC technology was chosen for this application because Aram wanted two-sided, peer-to-peer capabilities. In other words, the participant can see the instructor and the instructor can see the participant. The instructor also has the ability to turn on the live stream and provide encouragement, suggestions, etc. Therefore, finding a globally recognized team with much webRTC experience was crucial in order to successfully see Aram’s Train-With vision come to fruition. “I have been thrilled at the professionalism, expertise, and quality webRTC.ventures provided Train-With”, concluded Aram. Get on board the Video Consumption Digital Transformation. MySportsBox.video is a customizable application for sports channel networks looking for an alternative way to distribute sports video content and reach their viewers. We saw an opportunity to build a better experience to watch video on-demand in a new way by building custom apps, on top of the leading platform in the market: Amazon Alexa. Our app focuses on screen enabled devices which sports fans will love in order to engage with their teams and favourite sports! Maybe you have heard about webRTC, want to get started but first, need to learn more? Well, we have created a free WebRTC Training & Tutorials eCourse just for you. Our team at WebRTC.ventures often performs assessments and code reviews of Tokbox and other WebRTCbased applications, and callstats.io is a great tool to support those efforts. callstats.io is a great way to track any errors and performance statistics that your video app is having, and to diagnose those WebRTC related errors. 0ur WebRTC.ventures team of developers have previously participated in a number of TADHack events and even won coveted prizes and Awards in 2015, 2016 and 2017 for our innovative telecom app prototypes. Teams are challenged to create a hack or prototype using sponsor telecom technologies to solve a local or global problem. We are proud to announce that WebRTC.ventures will host TADHack Global 2017 in Buenos Aires, Argentina. In addition to Buenos Aires, this year’s 2017 event will take place in over 30 other cities across the globe from September 22-24 and September 29-October 1. Our WebRTC.ventures team of developers have previously participated in a number of TADHack events and even won coveted prizes and Awards in 2015, 2016 and 2017 for our innovative telecom app prototypes, but this is the first year we will be hosting. WebRTC.ventures is pleased to announce our inclusion in the SwitchRTC Technology Circle partner program, a small group of high quality development agencies certified to build video communication apps with the SwitchRTC Selective Forwarding Unit (SFU). Information Security is an increasingly important topic and one that is too often overlooked. This is true in all web development, but as WebRTC video technology continues to mature and become a more critical part of internet communications, it’s also true for WebRTC development. As our team has grown at WebRTC ventures, and as we serve more and more clients in all industry verticals, security has become more and more important. That’s why I’m pleased to announce publicly that we recently promoted Maynor Taisigüe to Information Security Officer for WebRTCventures (and for our parent company AgilityFeat).